Listen to the sound of the Irish fiddle as you play your way through this unique Celtic 3 reel, 9 pay line on https://www.easyslots.com Although this online slot only has three reels there’s always the opportunity to win 1000x your original stake. Play the fiddle, and the luck of the Irish may just be on your side. Eyecon truly are pioneers of the online slot promotions industry. Founded in 1997, this Australian gaming company have been going strong for twenty years. Having over one hundred and sixty games available to play, this developer aims to produce unique and enjoyable experiences for all of their players across the globe. Fluffy Favourites, as well as Irish Luck, both remain well-known staples of Eyecon’s portfolio – with over six billion spins every year on their games, this developer is in good stead to continue well into the future. For more new casino slots free spins promotions click now! Fiddle Dee Dough is one of the most simple – yet engaging – online slot games out there at the moment. Toying with the hugely common concept of the ‘Luck of the Irish,’ we see a simple aesthetic to match this theme. With happy leprechauns, Irish gold, and big tankards of frothy stout, this slot maintains a simple atmosphere, with a charming look. These cartoony symbols work exceptionally well when coupled with the four-leafed clovers and pots of gold in the background. It is clear that Eyecon aimed to create a slot game that can be played simply and without complication; this was certainly achieved. With no music, except for a stereotypical casino ‘win’ sound, Fiddle Dee Dough truly aims to bring the player some of their own luck. Compared to other online slot games seen nowadays – with fancy animations and excessively animated scenes – Fiddle Dee Dough distils the slot formula to its purest form. With a 3 x 3 reel, this game is the easiest I’ve seen in a while play, and to watch. With incredibly simple controls also – just a spin, an auto spin, and a change bet button – it is a welcome change that reflects its relatively low nine pay line system. 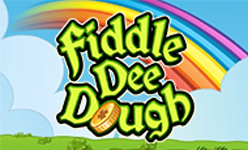 Due to this small reel system, however, Fiddle Dee Dough may not have as many multipliers as other games on the market. Although there are some not insignificant multipliers attached to the special symbols, the game itself does not have any specific quirks that allow it to randomise your winnings. Compared to other Eyecon games, which typically have a ‘Gamble’ feature – where you can double or quadruple your winnings by guessing the colour of the suit of a card correctly – Fiddle Dee Dough sticks to the basics… almost to a fault. Play online slots games now! Saying that, the fact that this game is so simple plays to its strengths. This online slot game has all it needs, and it plays to the strengths associated with low rollers. With a minimum bet of 0.01, and a maximum of 5.00, the spins are fast; ultimately meaning you do not waste time with fancy animations and ‘bonus rounds’. The symbols themselves reflect this simplicity: when three Scatter leprechauns are present on your board, you get eight free spins. During this time, the winnings are tripled, and you have the opportunity to strike lucky, and retrigger more free games. The Fiddle Dee Dough logo functions as a substitute for all the other regular symbols, as usual. 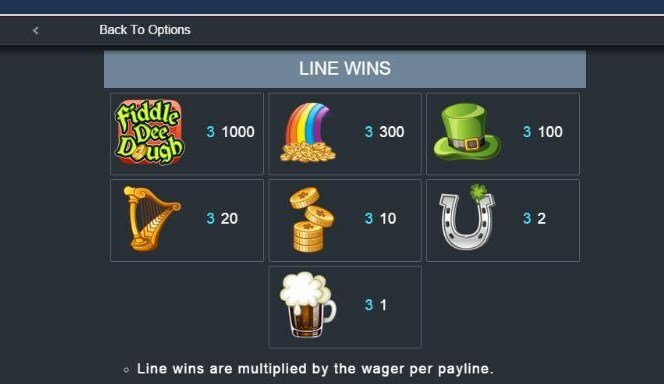 Probably the best aspect of this online slot game is that of the Pot of Gold, another scatter symbol. When this happens, the player is awarded three picks from their winning pot – awarding a prize that is up to 111x the original winnings. Spin the wheel today! 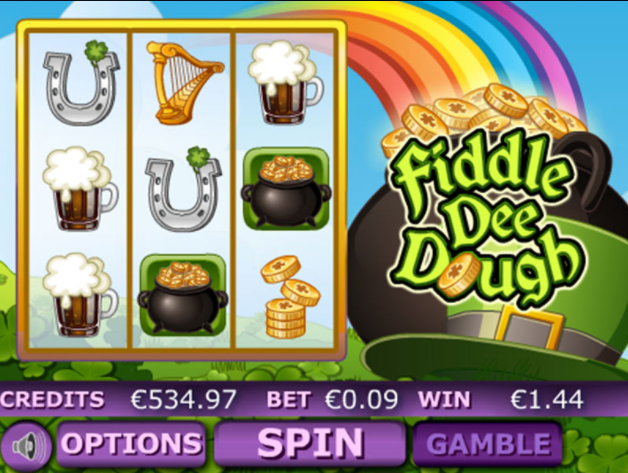 Fiddle Dee Dough is a game for low rollers and the high rollers, with a delightful Irish theme it's sure not to let down and you'll be searching for the end of the rainbow in no time. This game is an absolute delight. Here on Easy Slots are the most popular game is Stardust Slots Game. So get playing it if you haven't already to see just why it's number one! For more information, visit Easyslots.com !